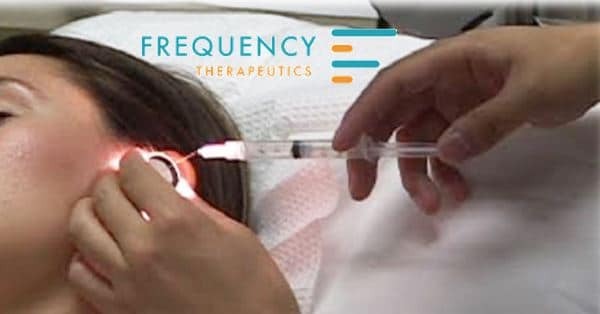 WOBURN, MASSACHUSSETTS – Biotech startup, Frequency Therapeutics, announced this week the completion of enrollment in the single dose safety trial to evaluate FX-322, the company’s leading drug candidate for hearing restoration. The randomized, double-blind, placebo-controlled trial will be assessing the safety of a single dose of FX-322 given by intratympanic administration in adult patients with stable sensorineural hearing loss (SSHL) who have a medical history consistent with either noise exposure or sudden hearing loss. According to the company’s press release, the safety trial is a randomized, double-blind, placebo-controlled, single-dose, multi-center study of FX-322, which was administered in patients with stable sensorineural hearing loss and is being conducted at several leading otolaryngology clinics in the United States. Patients received either an injection of FX-322 or a placebo in one ear with an initial follow up visit after two weeks and will continue to be monitored for the following three months. “We are pleased with how rapidly we were able to recruit patients with stable sensorineural hearing loss, which is a testament to the support from our Clinical Advisory Board, as well as the enthusiasm of our investigators and the participating patient volunteers,” said David Lucchino, President, Co-founder and CEO of Frequency. Information on the Phase 1/2 clinical trial being conducted can be found at clinicaltrials.gov with the identification number: NCT03616223. I too would be interested in participating in this trial if more candidates were needed. I am from the Boston area. Love to get more information on this trial. I’ve had a hearing loss since I was 18 months old. Would love to lead a normal life. Do you have signups on the West Coast? I would be interest in being apart of this trial if they are accepting people. Please consider treating children/teenagers who have hearing loss. My 14 year old son has been deaf since 6 weeks of age. Sensorineural/profound hearing loss. He is cochlear implanted on one side only, as we have always prayed there would one day be a cure for hearing loss. I’ll be following this closely.